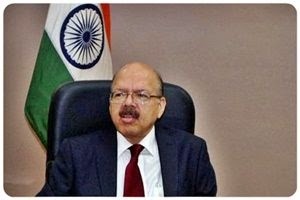 Dr. Nasim Zaidi has assumed charge as 20th Chief Election Commissioner (CEC) succeeding Sh. H.S. Bramha here today. Sh. H.S. Brahma laid off his office yesterday after completing his tenure. Prior to this Dr. Nasim Zaidi has served as Election Commissioner since 7.8.2012. Before joining the Election Commission, Dr. Zaidi had served the nation as a long time civil servant of the Indian Administration Service (1976- Batch). Speaking to media persons after taking over charge, Dr Zaidi said that ECI will formulate a strategic plan for 10-15 years based on principles of independence, transparency, professionalism, inclusiveness and measurable outputs. The plan will be based on all round institutional strengthening, voter education and an efficient election operation. Dr Zaidi further stated that he would like ECI to be more vibrant, transparent & accountable organisation, which is open to receiving new ideas and best practices. Commission will like to formulate its guiding Principles based on good governance..
“I feel privileged and honoured that I have been given this responsibility to lead one of the finest institutions that the Indian Constitution has provided a glorious institution that reinforces Indian democracy. I am also conscious of the onerous task in hand. As continuity is the hallmark in the working of the Commission, I look forward to building upon the excellent work done by my distinguished predecessors and meet the expectation of the people and all stake- holders. We have laid a simple vision: Free and fair elections based on error free and authenticated electoral roll with higher level of participation if voters with inclusiveness. As you know, we have continuously set high bench marks for ourselves. We would strive to deliver Elections which are spotlessly free, fair, peaceful transparent and highly participative each time. I would like to see the voter happy in his or her interface with the electoral system. ECI will focus on voter-centric activities form enrolment to enabling them with e-services. ECI will formulate a strategic plan for 10-15 years based on principles of independence, transparency, professionalism, inclusiveness and measurable outputs. The plan will be based on all round institutional strengthening, voter education and an efficient election operation. The Centre is very keen that the benefit of National Food Security Act (NFSA) reach all the beneficiaries effectively. An open discussion “Khadya Suraksha Panchayat” to make the implementation more effective was held today at Patna with all stake holders. It was chaired by Union Minister of Consumer Affairs, Food & Public Distribution, Shri Ram Vilas Paswan and was attended by Members of Parliament and leaders of various political parties of the State. Shri Ram Kripal Yadav, Union State Minister, Drinking water & Sanitation, Shri Ram Chandra Paswan, MP, Shri Chirag Paswan, MP, Smt. Veena Devi, MP, Shri Sushil Kumar Modi, Leader of apposition, Bihar Bidhan Parisad, & Shri Nand Kishor Yadav, Leader of apposition, Bihar Bidhan Sabha were also present on the occasion. About 8.71 crore people have been covered as beneficiaries in the state under the Act. On the receipt of data of about 7.61 crore beneficiaries from the State , about 4.1 lakh tonnes foodgrains are being provided by the Centre monthly which comes to about 49 lakh tonnes annually. The Centre expect the state Government will provide data of remaining beneficiaries soon so that they also get benefit of subsidized foodgrains. Addressing the media after the open discussion, Shri Ram Vilas Paswan, said that his Ministry is pursuing the Bihar Government to implement the NFSA (National Food Security Act) effectively and a number of communications have been sent to the State Government to complete all the remaining work for this purpose. He said that all the beneficiaries are yet to be issued fresh ration cards to avail subsidized foodgrain under the Act. Still a number of the eligible beneficiaries are not getting their food quota due to poor delivery mechanism, "Out of the 8.71 crore beneficiaries in Bihar (85 per cent in rural areas and 74 per cent in urban area) under the Food Security Act, about 1.11 crore people have not been issued fresh ration cards for availing their food quota at subsidized rate of Rs two per kg wheat and Rs three per kg rice, even after rolling out of the Food Act in March 2014 in Bihar he noted. He said that National Informatics Center has urged the State Government to upload the details of remaining beneficiaries on PDS portal which is still awaited. Meanwhile State has reported 49.74 lakh additional beneficiaries, however, they can get subsidized foodgrains under the Act only after their details are also uploaded on PDS portal by the State. Shri Paswan said that the Centre is very keen to make the PDS system more transparent in the Bihar by implementing end to end computersation. Financial assistance of Rs 17.89 crore was provided to the State in 2013-2014. Utilization certificate from the States is still awaited for the release of more money for this purpose. State has been requested to take up automation of foodgrain gowdons, movements of food grains and SMS alerts system for informing beneficiaries about their allocation. Report in this regard is yet to be received from the State Government. The ministry has also urged the State to provide more information to the beneficiaries through transparency portal as has been provided by other states. He assured that Centre will provide all possible support to the state in this regard. Referring to procurement of foodgrains in the State, Sri Paswan said that Bihar is a DCP State from KMS 2013-14 onwards; hence it is supposed to procure wheat & paddy for Central Pool through State Agencies. But he regretted that the procurement process in the State is very slow and sufficient infrastructure has not been created for this purpose. A notification regarding procurement of wheat during current Rabi is yet to be issued by the State Govt. The Govt. of India has already granted extension for paddy procurement thrice on the request of State Government for KMS 2014-15, he added. Regarding State Government’s claim for food subsidy, Sri Paswan said that he has directed his Ministry to release admissible amount promptly to the State. In 2013-14, against the claim of Rs.14.61 Crore, an amount of Rs.14.40 Crore was found admissible and was released to the State Govt. Similarly for 2014-15 ( from April, 2014 to December, 2014 ), against the claim of Rs.1452.08 Crore, an amount of Rs.1430.99 Crore has been found admissible and has already been released to the State Government under DCP Scheme . In addition to this, the State Government has also claimed Rs.1264.10 Crore in advance against ongoing procurement under DCP mode for 4rth quarter of 2015. Out of this also, Rs.302.41 Crore has been found admissible and already released in last month by the Govt. of India. He asserted that Food Corporation of India (FCI) has sufficient stockpile of foodgrains to meet Bihar's requirement. In view of the fact that the level of Non Performing Assets (NPAs) and the stressed projects of Public Sector Banks (PSBs) have been showing an upward trend in the last four quarters, the Department of Financial Services (DFS), Ministry of Finance is going to hold a meeting of CMDs of Public Sector Banks (PSBs) on 28th April, 2015 at RBI Office in Mumbai. In this meeting, case by case review of some of the major projects of infrastructure sector such as Road, Power, Steel and Shipping would be undertaken by the Ministry in the presence of Senior Officers of the Ministries of Power, Steel, Transport, Shipping and the Senior Officers of RBI. The objective of this meeting is to understand the problems faced by the project promoters and the banks in retrieving them and to find-out a solution to such problems. This meeting would help the Department to crystalise the actions required by Banks, Ministry of Finance and other concerned Central Ministries as well as support required from RBI. Second part of the ongoing Budget session of Parliament begins tomorrow i.e April 20, 2015 with the reconvening of the Lok Sabha. Subject to the exigencies of the Government’s business, this part of Lok Sabha session is scheduled till May 8, 2015. The first part of the Budget session that began on February 20, 2015 continued till March 20, 2015 when both the Houses were adjourned to enable the Department Related standing Committees to examine the Demands for Grants of respective ministries. Subsequently, the 234th Session of Rajya Sabha was prorogued and was summoned to be reconvened on April 23, 2015 and to continue till May 13, 2015. Both the Houses will have 13 sittings each in the second part of the Budget session of Parliament. Financial business including discussion on Demands for Grants for Railways and some select ministries and General Budget for 2015-16 and the passing of relevant Appropriation Bills and Finance Bill constitute the main agenda of the Government Business for the second part of Budget session. Lok Sabha is likely to discuss the Demands for Grants of Ministries of Home, Health and Family Welfare, Environment and Forests & Climate Change, Chemicals and Fertilizers and Drinking Water & Sanitation. Rajya Sabha is likely to discuss the working of the Ministries of Law & Justice, Petroleum and Natural Gas, Social Justice & Empowerment and External Affairs. The Micro, Small and Medium Enterprises Development (Amendment) Bill, 2015 is slated for introduction in Lok Sabha on April 20, 2015. The Government is keen about both the Houses of Parliament taking up for consideration the GST Bill, Disclosure of Foreign Income and Assets Bill and the Real Estate (Development & Regulation) Bill during the second part of the Budget session. Right to Fair Compensation and Transparency in Land Acquisition, Rehabilitation and Resettlement (Amendment) Bill further to promulgation of Land Ordinance for the second time is also to be considered during the session beginning on April 20, 2015. The Prime Minister, Shri Narendra Modi will confer the `Prime Minister’s Awards for Excellence in Public Administration’ for the years 2012–13 and 2013-14 to outstanding initiatives in Public Administration on the Ninth Civil Services Day which is being held here on April 21, 2015. To mark the Day, a two-day programme organised by the Department of Administrative Reforms and Public Grievances, begins on April 20, 2015 (AN). A number of outstanding initiatives in Public Administration in three categories – Individual, Team and Organisation - have been selected for the award for the year 2012-13 and 2013-14, from across the country. Under this scheme of awards all officers of Central and State governments, individually or as a Team or as an Organisation, are eligible. The award includes a medal, scroll and a cash amount of Rs.1 lakh. In case of a team, the total award money is Rs.5 lakh subject to a maximum of Rs.1 lakh per person. For an organisation, this is limited to Rs. 5 lakh. Unlike previous years, the Civil Services Day which is being held on two days this year, focuses on ‘Minimum Government, Maximum Governance’ with specific sectoral emphasis on Social Sector, Housing, Employment & Skill Development and Agriculture. The related sessions would be chaired by senior Union Ministers viz. the Union Minister of Raiways, Shri Suresh Prabhu, Minister for Skill Development, Entrepreneurship & Parliamentary Affairs, Shri Rajiv Pratap Rudy, Union Minister for Human Resource Development, Smt. Smriti Zubin Irani and other dignitaries Vice Chairman, NITI Ayog, Dr. Arvind Panagariya and the Professor from Indian Council for Research on International Economic Relations, Dr. Ashok Gulati. A number of eminent speakers in the respective fields are expected to deliberate on these issues of contemporary relevance and seek to address the challenges before the Civil Services in India and re-inventing government for efficient service delivery. During the event, a book on ‘Best Practices – Tomorrow is Here’ will also be released by the Prime Minister on April 21, 2015. This Day is being observed by all Civil Services to rededicate and recommit themselves to the cause of the people, since 2006. It provides a unique opportunity for introspection as also for working out future strategies to deal with the challenges being posed by the ever changing times. In its efforts to involve more and more sectors for Clean Ganga Mission, the National Mission for Clean Ganga (NMCG), the project implementation wing of National Ganga River Basin Authority (NGRBA) under the aegis of Ministry of Water Resources, River Development and Ganga Rejuvenation launched ‘Nirmal Ganga Sahbhagita’ here yesterday. The event marked the beginning of a sustainable partnership with 118 Urban Local Bodies (ULBs) located along the river for the cherished objective of a Clean Ganga. The event was jointly organized by National Mission for Clean Ganga and Indian Institute of Public Administration (IIPA). 78 ULBs from the four basin States in Ganga Basin ( Uttarakhand, Uttar Pradesh, Bihar and Jharkhand) participated in the event. The initiative was inaugurated by Sushri Uma Bharati, Union Minister of Water Resources, River Development and Ganga Rejuvenation. Senior officials from Ministry of Water Resources, River Development and Ganga Rejuvenation and Ministry of Urban Development also participated in the event. The Minister in her inaugural address cited the unanimous concern across the social strata for the cause of a Clean Ganga and emphasized upon the importance of the partnership and involvement of the Urban Local Bodies in the conservation of the river. She called upon each ULB to shoulder the challenge of making the Ganga rejuvenation mission a great success and a role model for conservation efforts for other rivers. Speaking on the occasion Shri TVSN Prasad, Mission Director NMCG and Joint Secretary in the Water Resources Ministry said this event will be the first stepping stone for a sustainable partnership between ULBs and NMCG in effective execution of projects at ground level. He suggested for a Project Implementation Unit (PIU) in each ULB which can act as a single window for project facilitation and information exchange. He also suggested for an Memorandum of Understanding ( MoU ) between NMCG, ULBs and State Level Program Management Groups (SPMGs) for a fruitful engagement with ULBs on developing a litter free corridor along the banks of the river, arresting the flow of solid waste in the drains that discharge into the River, establishing environmental monitoring stations at confluence points of nalas with the rivers , undertaking communication and public outreach activities for sensitizing the public about cleaning the river, developing model cremation ghats and dhobhi ghats, engaging unemployed youth and ex-servicemen for monitoring the water quality and project implementation and initiating livelihood programs. The contours of the MoU was presented by Professor Vinod Kumar Sharma of IIPA. A model mobile phone application that would enable the public and officials to upload the onsite photographs and other information about project implementation that can be viewed through the Bhuvan web Portal was presented before the participants by a senior official from National Remote Sensing Centre.